The 2015 brief for the International Society of Typographic Designers (ISTD), ‘The Rhetoric of Ekphrasis’, required a typographic response to a literary work that explores the descriptive nature of text. The design was required to address how the exchange between visual and verbal communication can impact interpretations and be persuasive. To achieve a strategic outcome, both primary and secondary research was used to inform the design of the artefact. This project focuses on the work of James Turrell, an artist who uses installations of light and colour to alter our perceptions of space. In 1981, the acclaimed international art critic, Robert Hughes, responded to an exhibition of Turrell’s work by discussing its immersive experience and what this made him think and feel. Schema explores the link between visual and verbal worlds through the medium of typography to communicate layers of meaning, in addition to the literal meaning of words. The project uses experimental typographic treatments of Hughes’ review. 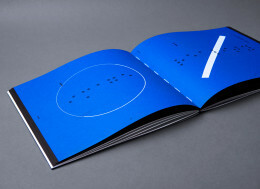 Through the combination of layout, font selection, treatment, and coloured grounds, the book presents a sequence of typographic experiments that immerse the reader in Turrell’s visual and conceptual world.